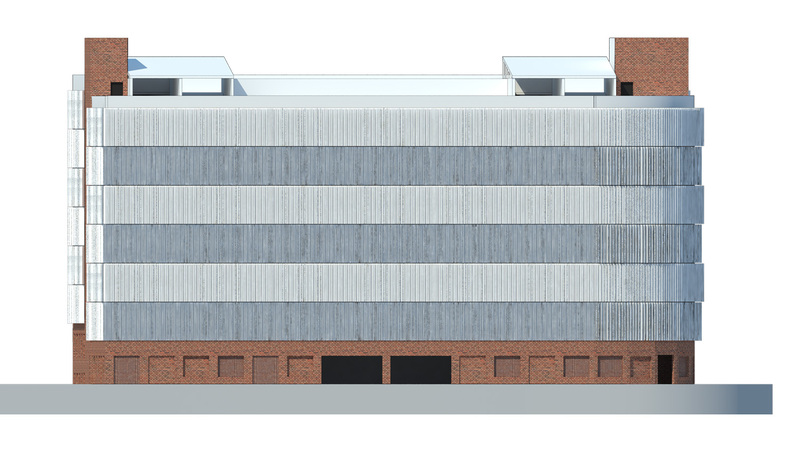 Our vision for the new parking house at plot I4 in Østre Havn, Aalborg is to create a sustainable facade with an emphasis on the use of recycled building materials. The basis of the facade design originates from the intentions of the district plan; creating a line of buildings which have a dark and warm base and simple, light building volumes above. The parking house is located within the city quarter, its simple and abstract facade adapts to the surroundings; the dark base responds to the low existing tile buildings, and the aluminium facade refers to the white neighbouring buildings of the area. The base and immediate context of the parking house give a sense of warmth and texture, bringing a human scale to the urban space. Giving a counterweight to the heavy base, the remaining facade design consists of white finished aluminium lamellas, made from recycled aluminium. The result is a simple and abstract facade with rhythm and relief, and without the bright facade absorbing all the of natural light in this dense urban area. Furthermore, the lamellas are constructed so that are easy to assemble and disassemble, which ensures that the aluminium can be reused again, in a new setting at the end of the building’s life. In this way, the parking house contributes to a sustainable future, with elegant use of recycled building materials. The parking house has a capacity of 395 cars.